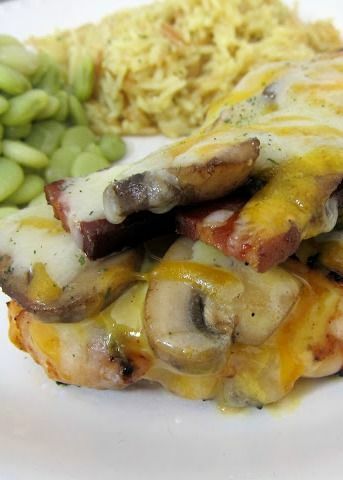 Alice Springs Chicken - copycat recipe from Outback Steakhouse - seasoned chicken, honey mustard, mushrooms, bacon and cheese - better than the original! Last week I shared our version of my favorite dish at Longhorn's. This week I am sharing my version of my favorite Outback dish - Alice Springs Chicken. It has everything I love - chicken, bacon, honey mustard and cheese. The original recipe has mushrooms on it. I always order it without mushrooms, but I added sautéed mushrooms to Chicken Legs piece because he loves mushrooms. I marinated the chicken in Larry's Sweet Southern BBQ Seasoned Salt marinade. I thought it would be pretty close to the flavors that the restaurant uses. I was right; it tasted like it was straight off the barbie. Chicken Legs can't decide if he likes this chicken or the Garlic Parmesan Crusted Chicken I posted last week. He finally decided that he liked which ever one he was eating best! He has already requested this again this coming weekend and wants to double the recipe for leftovers. Marinate the chicken in the Lawry's Original Seasoned Salt marinade for at least 30 minutes. The longer the better. While the chicken is marinating, cook the bacon in a large skillet. Set aside. Reserve 2 Tablespoons of bacon fat. Sauté mushrooms in bacon fat until softened. Set aside. Grill the chicken 12-15, minutes until done. You can also cook the chicken in a skillet on the stove if desired. Preheat the broiler on your oven. Place cooked chicken on a rimmed baking sheet. Spread 1-2 Tbsp honey mustard on cooked chicken. Top with bacon, mushrooms and cheese. Broil until cheese is melted. That looks delicious! It's a real shame my hubby is cutting out fats and red meat right now because we would love it. Saving for future use. I've never had Alice Springs Chicken because I always walk right into Outback and order the Filet. This looks amazing Stephanie. Thanks for posting the recipe and you can bet I'll be giving this one a try. This is my fav dish at outback too! I'd take mushrooms on mine too! Thanks for posting this!! This is my favorite recipe at Outback too and I have wanted to make it at home!! This is one of my favorite restaurant recipes too. We've been making it for years and years and the kids never get tired of it. I just made this for dinner and it was AWESOME!!! This is my favorite dish at Outback. Thanks for posting the recipe!! I love that you served it with Lima Beans. I love Lima Beans and always feel like I'm in the minority! I just made this, and it was amazing! I made my own honey mustard, which was such a nice touch. I will definitely be making this again! I've made your recipe a couple of times for company, and it has been a huge hit. Thanks for sharing this one! It's a definite keeper. My favorite dish at Outback, I just wish there was a lower calorie version. Carolyn - use light honey mustard dressing, turkey bacon and light cheese. All the flavors and lower calories. Came across this recipe on Pinterest and made it last night; it was fabulous! Thanks so much for sharing! Is there a calorie count on this please?